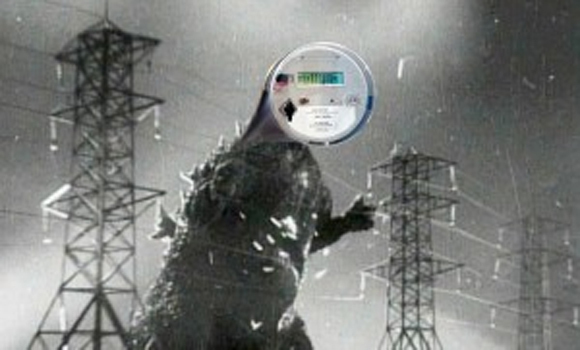 Industry mouthpiece SmartGridNews finally admitted that “smart” meters are surveillance devices. Of course they didn’t quite put it that bluntly. In fact, they celebrate the ability of utilities to know what appliances people use as another tool to help craft the wonderful world of the future. The SmartGridNews article, entitled “Now utilities can tell customers how much energy each appliance uses (just from the smart meter data),” is here. Here is breaking news. SmartGridNews has just come out of the closet and admitted what I and others have been saying all long: “Smart” meters are surveillance devices. APS and utilities nationwide have been denying the surveillance capability of “smart” meters but here is one of the foremost “smart” meter cheerleaders in the world finally admitting the truth. SmartGridNews calls such “smart” grid industry names as Telvent, Silver Spring Networks and Lockheed Martin its “major sponsors”. So of course the news story attempts to put a positive spin on the surveillance, hyping such nonsense as an “over 4% conservation [of energy] after just a few months”. Wow, that means I might save four whole dollars and change on a one hundred dollar electrical bill. Where do I sign up to be spied on? Enclosed is the SmartGridNews article, Now utilities can tell customers how much energy each appliance uses (just from the smart meter data). PS – In the article, note the creepy picture of a guy dressed in black and using binoculars. SmartGridNews is shameless to promote Peeping Toms as cool. Note also Orwellian phrasing such as “behavioral science“ and turning ratepayers into “willing partners“. It’s not a “smart” grid; it’s a sick grid.